In the market for a pair of Bluetooth earphones? Ever consider a true wireless pair? You know, with no cable or tether to worry about? Our Deal of the Day is the TREBLAB X11 Earphones, which are currently only $32.99 (83% OFF) in the AndroidGuys Deals Store. These earbuds are an excellent workout companion as they’re completely sweat-proof; the ear-fins keep them snugly in place during rigorous activity. Moreover, they feature passive noise cancellation and wireless HD audio which means excellent sound quality during music playback. Phone calls sound great too, thanks to the integrated microphone. 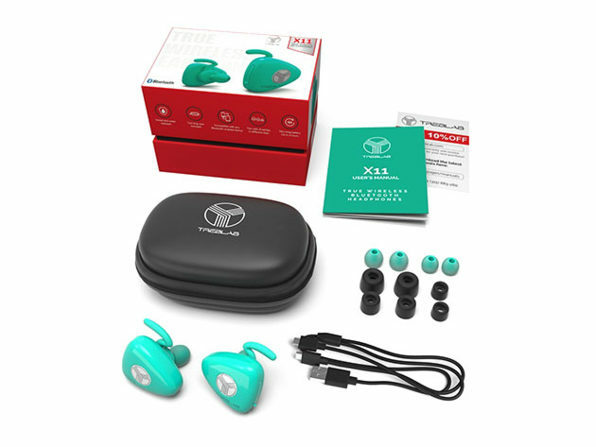 Available in a variety of colors (white, teal, black, and pink), the TREBLAB X11 Earphones are just $32.99 in the AndroidGuys Deals Store. Hurry, and you’ll save some 83% off the normal cost.